Welcome!! On this website you can view over 12,000 designs of carved wood and HDU signs and plaques, the largest collection of carved signs & plaques shown online anywhere. We make 2.5-D and 3-D signs and plaques for every style and application. Our premium custom hand-crafted dimensional signs & plaques are fabricated from the finest materials and are made using outstanding craftsmanship by skilled and highly talented artists and artisans.We design and manufacture over 7000 beautiful custom signs & plaques each year. We have over 50 pages of galleries containing photos of our sign designs, and we add about 20 photos of new beautiful signs each week. We realize this website, because of its size, may be a little challenging to navigate. This page gives an overview of the contents of our 50 Photo Galleries, and makes it easy to find the products you may be looking for. Each numbered Gallery page is described below. To facilitate searching through designs that may be of interest to you, we have these organized into Product Galleries (type of sign material, size and related cost) and Application Galleries (use or application of the sign). These are listed for ease of navigation in the light gray boxes in the lower left margin; please click on a text title to go to that Gallery page. Each Gallery page also describes the types of signs and plaques made for that application and approximate prices. Alternatively, to find a specific type of sign, such as "Oak leaf address sign", or "sign with Skiier on it" , or "red wooden stop sign", or "lawyer directory sign" or "B&B sign", or "sea horse beach sign", please enter these key words in the box on the top right of this page with "Google" in it and the search engine will give you examples of signs on this site, which you can click on to go to the referenced page. If you are looking for wall or podium plaques, we highly recommend you visit our companion website, Custom Carved Wood & Metal Wall and Podium Plaques, www.woodmetalplaques.com, where we show over 2000 photos of examples of these plaques for federal, state and local governments, courts, the five military services, police & fire departments, universities & schools and clubs, companies, sport teams, and families. Galleries 10A, 22, and 30 through 35 on this website show many of these plaques, but the www.woodmetalplaques.com website is much more comprehensive and also gives specific prices for various sizes and styles. You can see 200 of the most recent signs we have made on our Signs-of-the-Month page. 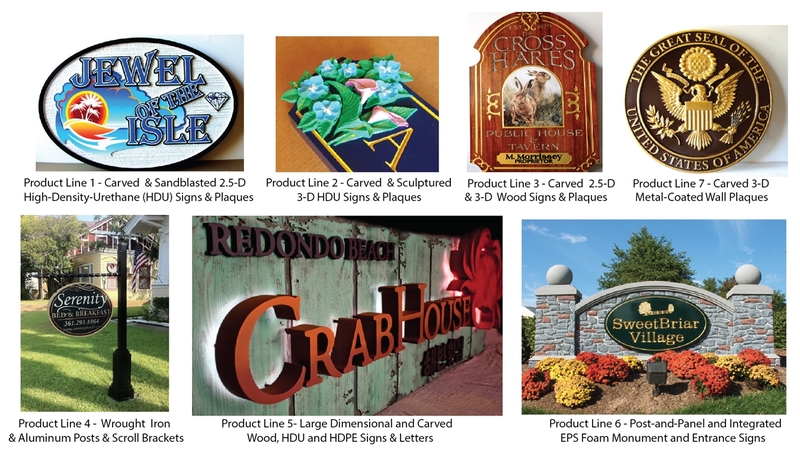 That page gives an overview of the wide variety of styles and materials we offer for our dimensional signs & plaques. Looking for ideas for a gift or present? Please visit our Gallery 9, Gifts and Presents page. Our prices and design features are described on the Sign Prices and Design Features page. Please refer to the sign letter-number identifier (e.g, U30163) when inquiring about a sign design/size/price. Call us at 951-698-8484 or EMAIL us at info@ArtSignWorks.com for more information. These have example signs from different Product Lines grouped for specific applications and uses. If you cannot find what you are looking for in one photo Gallery, try a related Gallery. Please click on the Underlined text below or on one of the light gray numbered buttons in the left margin to visit that Gallery. You can also search using the Google search bar customized for this website, located in the upper right of the header. Custom signs and plaques, for both indoors and outdoors, suitable for gifts and presents, including Holidays, birthdays, anniversaries, Christmas, and housewarmings, are shown in photo Gallery 9. Our sign galleries include about 12,000 designs, and we can create hundreds of thousands of other possible design combinations (colors, font styles, artwork). We will design you a unique custom sign design at no additional cost. Refer to ID number (e.g. M1421) if you want your sign to be similar to one or more signs shown in the Galleries. You can start the process with a phone call to 951-698-8484, an email to info@artsignworks.com, , or by filling out our form on the Request a Design and Price Estimate page, and our knowledgeable Customer Service Representatives, Christie and Regina, will be happy to help you. Examples of Signs & Plaques for Galleries 10 through 12 Described Below. 10 - Law Office, Attorneys, Lawyers, Prosecuters, Judges, Courtrooms Signs & Plaques. Outside and inside custom signs & plaques, for law offices, attorneys, lawyers, prosecuters, public defenders, judges and justices, courtrooms, judge chambers, podiums, law schools, and legal aid organizations (250 signs & plaques on 2 pages). Our companion website, Wood & Metal Plaque for Federal, State and Local Courts (click) shows dozens of additional courtroom wall plaques along with their prices. 11A - Dentist and Orthodontic Office Signs. Outdoor & indoor custom signs & plaques for dentists and orthodontic offices (110 signs & plaques). 11B - Veterinary and Animal Clinic/Hospital Signs. Outdoor and indoor custom signs & plaques for veterinarians and their clinics & animal hospitals (50 signs & plaques). 12 - Financial - CPA, Banks & Mortgage Company, Insurance Agency, and Realty Company Signs & Plaques. Outdoor and indoor signs & plaques for CPAs, tax services, banks, savings & loan companies, realtors and real estate companies, and insurance agencies (140 signs & plaques). Examples of Signs & Plaques for Galleries 13 through 17 Described Below. 13 - Church & Synagogue Signs, and Custom Carved Religious Plaques. Monument, entrance, and directional outdoor and indoor custom signs and plaques for churches, temples, and synagogues, as well as some very beautiful indoor carved wood religious plaques that can be customized. We also have pew reserved plaques and memorial wall plaques (120 signs & plaques). 14 - Golf Course & Country Club Signage. Entrance and monument signs, tee signs, yardage signs, directional signs, 3D course maps, building signs, pro shop signs, rule & traffic signs, 19th hole/restaurant/bar signs, tournament signs & banners, indoor mahogany & cherry wood wall plaques (perpetual awards, officers, club champion, photo, brass tag signs). Also wrought iron hangers and posts and residence address & welcome signs with a golf theme (160 signs & plaques). 15 - City Welcome, Government Building, and Museum Signs & Plaques. Outdoor & indoor signs & plaques for federal , state, county, city and municipality roads and buildings such as state, county and city "Welcome" signs, and exterior building identification and directional signs, and indoor signs and plaques. The bottom of the Gallery page shows signs and plaques for museums and historical buildings (110 signs & plaques). 15A - College, Secondary, Elementary and Pre-School Signs & Plaques. Outdoor & indoor signs & plaques for Universities, colleges, public & private secondary schools, middle schools, elementary schools, pre-schools, nursery schools and day care facilities. Monument, entrance, wall, hanging, and post signs are included, as well as indoor building & award plaques (110 signs & plaques). 16 - National, State, Regional & RV Parks, Campgrounds, and Trail Signs . Custom signs for national parks, monuments and forests; state parks; and regional and county parks including entrance, monument, directional, building, campground, campsite, trail marker and milestone sign posts, and trail signs. It also includes signs for RV parks and RV unit name signs, This gallery shows signs associated with camping, RVs, hiking and backpacking. City /community parks are in Gallery 16A below (170 signs & plaques). 16A - City, Community and Private Parks & Gardens . Custom signs for city and community parks, private, and HOA parks; and community, private and residential gardens of all types, including botanical, rose, other flower,and arboretum gardens. Also individual plant and tree markers and plaques (180 signs & plaques). 16C - Funeral Home, Cemetery, Mausaleum, Mortuary, and Memorial Signs & Plaques Custom outdoor & indoor signs for cemetery areas, administration buildings, chapels, mausaleums, directional signs, 3-D maps, and indoor plaques and signs. Also memorial signs for churches and graves, and memorial parks,benches and trees , including pets (70 signs & plaques). Our companion website, Wood & Metal Plaques (click) shows dozens of additional memorial wall plaques along with their prices. 17 - Street, Traffic & Reserved Parking/No Parking Signs . Custom signs for streets, traffic, and parking/reserved parking/no parking. Includes children playing, stop, yield, speed limit, private driveway, and no trespassing signs. Also reserved parking signs with name/logo. we also have custom deer crossing, horse crossing, cattle crossing, rabbit crossing and gecko crossing signs (220 signs & posts). Examples of Signs & Plaques for Galleries 18 through 24 Described Below. 18 - Residence and Estate Address and Property Name Signs. Outside custom signs for house numbers, house "welcome", and estate names, usually put on driveway intersection to a road, a front gate, along a driveway, or on a house wall or door (330 signs & plaques on 2 pages). Indoor house plaques are in Galleries 21 or 30. 19 - Apartment, Condo, Townhome, HOA, and Subdivision Community Entrance and Monument Signs. Entrance and monument signs for apartments, condominiums, Home Owner Associations(HOA), subdivisions, and other residential communities (140 signs). 19A - Apartment, Condo, Townhome, and HOA Building and Directional Signage. Building, directional, 3-D map, rules, recreational facilities, parking , unit number, and miscellaneous signage for apartments, condominiums, Home Owner Associations(HOA), subdivisions, and other residential communities (220 signs & plaques). 19B - Yard-of-the-Month, Garden-of-the-Month, and Home-of-the-Month Signs for Home Owner Associations (HOAs "Best of the month" yard, garden and home signs for Home Owner Associations, subdivisions, and other residential communities where homes have individual yards & gardens (45 signs & posts). 20 - Seashore & Beach Residence and Business Signs; Sea Birds, Fish and Mammal Signs and Plaques; Nautical Signs and Plaques. Custom signs & plaques for residences and businesses near the seashore and beach. We have many beach home signs, with interesting beach and nautical art. We also make signs for harbors, marinas, and mahogany plaques for yacht nameplates and haleports.We have a great variety of artwork, including 3D carvings, for sea birds, bonefish, ocean fish, porpoises, whales, sea otters, and sea lions, and also nautical items such as sailboats, lighthouses, ships wheel, anchors, rope, etc (480 signs & plaques on 3 pages). 21 - Lake & Mountain Vacation Home, Cabin & Cottage, and Business Signs; Wild Animal, Fish, Bird and Tree Signs & Plaques . Custom signs for vacation homes around lakes, rivers and mountains (cabins and cottages) , hunting and fishing lodges and businesses (e;g., guide services, stores), and wild animal (bears, deer, elk, moose, wolves,cougars, raccoons), fresh-water game fish (trout, bass, muskies, etc), birds, trees and wildflower signs and indoor plaques (420 signs & plaques on 3 pages). 22 - Custom Indoor Signs & Plaques. Custom indoor signs and plaques, many being natural wood. These include those for businesses as well as residences; generally they are wall plaques but also include overhead hanging signs. They are many plaques for children's rooms, kitchen, family room etc. We also include zodiac signs and coats-of-arms and heraldry plaques on this page (170 signs & plaques). Our companion website, Wood & Metal Plaques for Homes & Families (click) shows over 50 additional family and home wall plaques along with their prices. 23 - Farm, Ranch, Western and Cowboy Signs and Plaques Custom farm and ranch signs, primarily for outdoors.These cover Eastern, Midwest, Southern and Western farms as well as Western ranches. These can be entrance, building, or directional signs. Included in this Gallery are farm animal (cattle, chickens, horses, hogs) , crop (wheat, corn, fruit, vegetable),scenery, and tractor/barn/farmhouse/barnyard signs. Western Ranch signs include cattle, horses, cowboys, and rodeo events. We also have some Native American signs and plaques we can customize with your name or tribe. We have both rustic and more fomal wood & HDU signs in this Gallery (380 signs & plaques on 2 pages). Most horse signs are in Gallery 24 below. 24 - Horse and Equestrian Signs & Plaques. Signs for residences (with your favorite horse), horse barns, horse ranches and farms, breeding farms, equitation centers, horse stalls, riding rings, horse shows and events, and horse racetracks (220 signs). Examples of Signs & Plaques for Galleries 25 through 29 Described Below. 25 -Restaurant, Seafood, Pizza, Coffee Shop, Deli, Fast Food & Food Store Signs & Plaques.Custom outdoor and indoor signs & plaques for full-service restaurants for seafood, Italian, Chinese, Thai, etc; , delicatessens, fast food restaurants, pizza parlors, cafeterias, coffee shops, ice cream shops, fruit & vegetable stands, and food stores of all types (200 signs & plaques). 26 - Winery, Vineyard, Wine Cellar, Wine Shop, Wine Bar Signs and Plaques Outside and inside custom signs and plaques for commercial wineries, vineyards, wine cellars, wine shops, and wine bars. It also contains indoor wall plaques for home wine cellars/tasting rooms (110 signs & plaques). 27 - Bars, Pubs (Irish & English) & Tavern Signs and Plaques We show outside and inside custom signs and plaques for every type of watering hole, including commercial bars,cocktail lounges, tropical bars, sports bars, saloons, cantinas, and a large section on English and Irish taverns and pubs. This page also shows a few home bar signs & plaques (150 signs & plaques). 28 - Retail Store, Mall, Shopping Center, Strip Mall, Commercial Business Park, Industrial Park, Company & Corporation Large Entrance and Monument Signs . Large outdoor entrance and monument signs for retail stores, malls, service stores, business and industrial parks, and company and corporate buildings of all types. These include outside entrance, identification, and store directory signs for all types of businesses. These are typically 6 ft to 15 ft wide and are made of masonry, stucco, EPS, steel, wood, HDU , and may have a marble, bronze, iron, HDU, or plastic facesheet or stand-off letters and logo (110 signs). 28A - Medium-size Outdoor & Indoor Retail Store and Business ( Wall and Overhead) Signs. Medium-size outdoor and indoor signs for retail and service stores, companies, and offices of all types. These include overhead wall store signs (for malls and airports), building signs, overhead hanging signs, window signs, and door signs. These are typically 84 inches or less in width (340 signs & plaques on 2 pages). 28B - Small Interior Signs & Plaques for Stores, Businesses and Companies. Smaller interior wood and High-Density-Urethane (HDU) signs and plaques for retail and service stores, companies, and businesses of all types. These include wall signs, door signs, directional signs, area identification signs, and POP (Point of Purchase) and POS (Point of Service Signs). These are typically 24 inches or less in width (70 signs & plaques). 29 - Hotel, Resort, Motel, Inn and B&B Signs and Plaques. Signs for hotels, resorts, motels, inns, and Bed & Breakfast's(B&B). We make entrance, monument, roadside, directional, building, interior, room name and room number signs and plaques (110 signs & plaques) . Examples of Signs & Plaques for Galleries 30 through 35 Described Below. 30 - Signs & Wall Plaques for Federal Government Organizations and Employees. Custom carved wood and HDU wall and podium plaques showing great seals, insignia,emblemsand logos on round plaques, shield plaques, etc. of federal government organizations, including the US Great Seal,the executive branch, cabinet departments, civilian agencies, the congress, and the federal courts, including individual award , achievement, and memorial plaques. Included in this Gallery are plaques for civilian law enforcement and intelligence agencies, including the FBI, Secret Service, US Marshal Service, ATF, Homeland Security, Border Patrol,, CIA, and the NSA. The US Coast Guard in included in Gallery 31, since it is considered a member of the Armed Forces. These plaques and signs can be customized or personalized to your specifications (220 plaques). Our companion website, Wood & Metal Plaques for the Federal Government (click) shows over a hundred additional Federal Government organization seal wall and podium plaques along with their prices. 31 - Signs & Wall Plaques for US Military Organizations and Individuals. Organization or Unit Identity, Crest, Insignia, Emblems, Logos, Round Plaques,, Building Signs, Command Boards, and Award, Achievement and Memorial Plaques. Custom carved wood and High-Density-Urethane (HDU) carved wall (indoor & outdoor) and podium plaques showing emblems, great seals, insignia, logos, etc. of any military organization or unit, including US DOD, Navy (including USN ship plaques), Marine Corps, Air Force, US Army, Coast Guard, and Merchant Marines. Homeland Security and Border Patrol plaques are in Gallery 30 above. We will make these any size, any shape, any color, any art, any text. These can be personalized and customized to your specifications including organization name/motto, individual name, rank, citation, etc. From 12 inches to 15 feet wide (550 plaques & signs on 3 pages). Our companion website, Wood & Metal Plaques for the Military (click) shows hundreds of additional wall and podium plaques of the seals, crests, logos, insignia, etc of DoD and all 5 services on 7 pages along with their prices. 32 - Wall Plaques for US State Seals and State Government Organizations and Agencies, including Organization and Employee Awards. Organization Identity, Insignia, Emblems, Logos, Round Plaques, and Award, Achievement and Memorial Plaques. Custom carved wood and HDU wall (indoor & outdoor) and podium plaques showing emblems, seals, insignia, emblems,logos, flags, badges and shoulder patch designs, etc. for any US State or state agency, including State Police, Courts, etc. We design out custom plaques to have any size, any shape, any art, any text . These are customized to your specifications including employee or organization name, position, years of service, citation, etc. We offer sizes from 10 inches to 12 feet wide (160 plaques). Our companion website, Wood & Metal Plaques for State Governments (click) shows hundreds of additional wall and podium plaques featuring Seals of every US State and other state organizations, along with their prices. 33 - Signs & Wall Plaques for City, County, Police Dept, Fire Dept, Courts and Agencies, including Employee Awards. Custom carved wood and HDU wall (indoor & outdoor) and podium plaques showing seals, emblems, insignia, badges, logos, and shoulder patches, both round & shield plaques, etc. of any local government or their agencies, including Counties, Cities & Towns. Examples include Mayor or City Manager Office, City Council, Board of Supervisors, Police, Sheriff, Fire Department, Utility Districts, Municipal Courts, etc., etc. We can make any size, any shape, any art, any text, any color, with optional gold-leaf, personalized to your specifications for organizations or individuals (achievement, award or memorial) including name, position, years of service, citation, etc. We offer sizes from 12 inches to 12 feet wide (220 plaques on 2 pages). Our companion website, Wood & Metal Plaques for Counties (click) shows hundreds of additional wall and podium plaques featuring seals of many Counties and other county organizations, along with their prices. Additional related photo galleries on this website include several hundred plaques featuring seals, badges, emblems, insignia and logos for Cities & Villages, Police & Sheriffs, and Fire & Emergency Services (click on one of these to go to that web page). 34 - Signs & Wall Plaques for Universities, Colleges, Fraternities & Sororities, and Public & Private Secondary and Elementary Schools. including Employee, Student and Individual Awards. Custom carved wood and HDU wall (indoor & outdoor) and podium plaques showing seals, emblems, insignia, badges, logos, and shoulder patches, both round & shield plaques, etc. of any university, or school. Examples include outside identification signs and inside wall plaques for reception, lobby, hallway, auditorium, gymnasium, office, podium; .school graduation , valedictorian , teacher-of-the year , employee -of-the-year, best school award, We make these in any size, any shape, any art, any text, any color, with gold-leaf optional, personalized to your specifications for organizations or individuals (achievement, award or memorial) including name, position, years of service, citation, etc. We make these in sizes from 12 inches to 10 feet wide (170 plaques).Our companion website, Wood & Metal Plaques for Universities & Colleges (click) shows dozens of additional wall and podium plaques featuring seals of many universities & colleges , along with their prices. Additional related photo galleries on this website include several hundred plaques featuring seals, coat-of-arms, emblems, and logos for Fraternities & Sororities and Public & Private Secondary Schools (click on one of these to go to that web page).